Too many karate-ka today relegate kata to a secondary status behind practice of kumite. This is a mistake. This view, I believe, represents a profound misunderstanding of kata’s role and purpose. Kata allows students to share a pool of knowledge which the greatest karate-ka of the past, and present, have used to study the Way. The kanji (Chinese character) for kata can be interpreted as a pictograph representing a bamboo lattice window. Sunlight can shine through such a window leaving a pattern which is defined by not only light but also the presence of shade. This “Yin-Yang” essence in kata is noted in such opposites as fast/slow, hard/soft & still/movement. For example, at the end of any given combination in kata the particpent should pause before moving to the next direction to create Zanshin (continued alertness) and a Yin/Yang event (i.e. often kata are rushed, and practitioners do not pause long enough before changing directions – the pause creates the moment and contrast to movement and speed). When studying in Japan several of my teachers (including Sotokawa 8th Dan Shito-ryu, Uetake 7th Dan Shito-ryu and Iba, 8th Dan Shito-ryu) would emphasize a slow count of 1-2-3 before changing to the next direction, or set of moves. Each kata represents an archived library of self defense techniques. Often the application of each motion within kata is not well understood within many Japanese karate dojos unless the effort has been made to dive into the Okinawan and Chinese roots. One should aim to understand and practice at least one bunkai (breakdown of movements) motion for each action in a kata (probably no one can know all and be proficient in all bunkai variants). Most of the original applications do not involve the basic kicks and punches which are often given as an interpretation, but rather grabs, breaks, pressure points and close in fighting. The elaborate nature of these actions (symbolized by individual kata motions) are challenging even for black belt ranks to know, practice and execute proficiently. Once a bunkai is understood it should be drilled with partners (like drill kumite combinations) at high speed, and in repetition. Kata demands techniques executed with precision and power. It trains the body to strike from different stances and different orientations, as is always the case in kumite. Kata trains one to move quickly, and to use precise and stable stances for the execution of solid techniques. Without this ability one will be unable to control an opponent during battle. Furthermore, if one cannot execute precise and powerful technique in kata, it will definitely not happen in the heat and chaos of kumite. 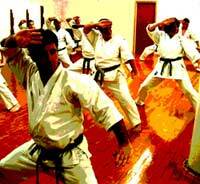 Visualization of the opponent for each move is one method of kata development that can be done as a drill. It helps bring a kata to life accentuating "kime" (focus), "penetration" and "zanshin". This is one of many training approaches to develop kata, however one must always remember that when kata is performed in a non-training sense (i.e. its final form) it should embrace “Mushin” (no mind, no thought). “Mushin”, a high goal of all martial artists, allows the mind to be open to all possibilities in the fighting engagement with no hesitation or change of thought pattern prior to execution. As one approaches black belt, kata must begin to feel like it is a true expression of oneself, presenting all inner and outer attributes. Therefore, when kata is performed, the presence of “Ki” (internal energy) and spirit can be felt, something which demands the attention of onlookers. Dr. Jason Armstrong, 5th Dan, has been training for more than 20 years. His training began in Australia, and then he moved to the USA in 1991. In 1995 he began regular travel to Japan and spent time living in Japan for karate. While in Japan he worked in the corporate environment and ultimately became the CEO of a company in Tokyo. He holds a Ph.D. in human physiology. Today he has founded Applied Zen, which operates in the USA and Australia passing on Japanese karate through dojos and through a video e-learning site (www.DownloadKarate.com). Additionally, his organization provides corporate seminars on the integration of Budo Strategy, the “Art of War”, and Zen into the corporate world and business.